Day 1: To begin our visit to Madrid, we enjoyed a walking tour that covered the highlights of the old city. Madrid was established as the permanent capital of the Spanish empire in the 1560’s when King Philip II moved his court there. Before that the ruling monarchs had moved their court to various locations on a rotating basis. But, Toledo had been the crown jewel of Spain, home to the most elaborate cathedral and most Spanish aristocrats. Even after Madrid became the capital, Toledo still had considerable influence, even playing a major role in preventing Madrid from having its own cathedral until 1993. After our tour we headed to Mercado San Miguel. This glass and iron building was originally constructed in 1916. It is home to about 30 vendors that offer a massive variety of tapa, olives and baked goods. It is a feast for the eyes and for the taste buds. Day 2: We spent most of the day in the Prado Museum, perhaps the most important art museum in Spain. This year is its 200th year in operation. The museum houses a substantial number of masterpieces many of which were either sponsored by or purchased for the Spanish royal families. Francisco Goya is sometimes described as the first of the great Spanish masters and his work is well represented at the Prado. 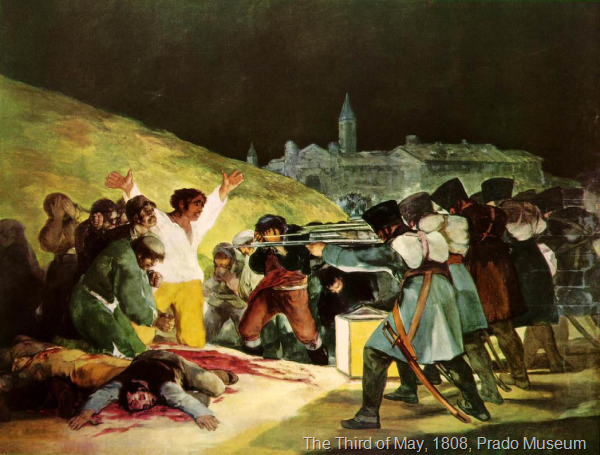 Goya’s El dos de Mayo and El tres de mayo rank among Madrid’s most emblematic paintings. His disturbing Pinturas Negras (Black Paintings) are so named for the distorted animal like appearance of their characters and the Saturno devorando a su hijo (Saturn devouring his son) is disturbing. Other artists with a significant representation are Diego Velazquez, Peter Paul Rubens, El Greco, Bartolome Murillo, Raphael and Rembrandt. We ended the day with a flamenco show at the Teatro Flamenco Madrid. We don’t have a deep understanding of flamenco but we were told that the music and dance were brought to Spain by gypsy people coming from Eastern Europe. It was born out of the angst resulting from hard times and difficult circumstances, something akin to the Blues. I have seen imitation flamenco shows before and now feel we know what the real thing looks and feels like. We were truly moved by the skill and passion of the performers. The guitar, the singing and the dance were all terrific. Day 3: We took a day trip to Toledo, an ancient city with a rich political and social history. At one time, Catholics, Jews and Muslims co-existed peacefully here. This past can be seen in the horseshoe-arched mosques, Sephardic synagogues and one of Spain’s finest Gothic cathedrals. This is all set in a very dense historical center with narrow winding streets, posed high atop a gorge overlooking the Rio Tajo. After returning from the tour, we enjoyed a lunch at one of the cafes in Plaza Mayor. We had a some of the local favorites, bocadillo de calamares (fried squid on a crusty roll) and patatas de bravas (cubed potatoes with a spicy tomato sauce). Day 4: On this day we headed out to visit the massive Parque del Buen Retiro. The heart of this 17 square kilometer park is an artificial lake that is watched over by a massive monument to Alfonso XII. There is also the Palacio de Cristal, Palacio de Velázquez and many statues among the trees. Since we were there on Saturday, there were lots of people enjoying the beautiful weather strolling the park, walking their dogs, playing with their kids and having a snack at one of the many cafés within the park. On our way to the park we stopped at Palacio de Cibeles (formerly the Palacio de Comunicaciones.) This emblematic building sits on Plaza de Cibeles which surrounds the Cibeles fountain (Roman goddess of nature). The building originally opened in 1919 as the headquarters for the postal service and is very beautiful inside. From the 8th floor you can access a lookout tower which provides a terrific view of Plaza de Cibeles and Calle de Alcalá beyond. Day 5: Sunday morning at El Rastro flea market is a Madrid institution. The market, located in the La Latina section of the city is massive, dominating several blocks of many adjacent streets and several plazas. You can find all manner of clothing, household goods, electronics, luggage, tools, books, records and many other items. Since we got there early, we were able to get into Bar Santurce which is wildly popular during El Rastro. This bar is famous for their sardinas asadas (grilled sardines) and pimientos de padrón (green peppers). Very tasty.